This was a limited run shirt, created by Rachel Perkins. At .conf 2013, these shirts were given to awesome folks who were active in the Answers and IRC communities to recognize their contributions. 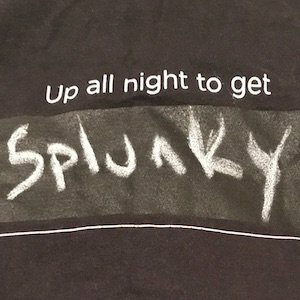 Unlike other official splunk shirts, this one has a chalkboard on the shirt, so the wearer could write and change what they were up all night to get.